submarines sank the battleship, each carrying four tons of Amatex housed in two side cargo pods. 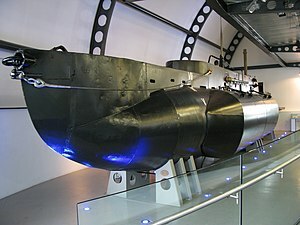 Even though RN Xclass submarines did attempt to sink her, it was the Lancaster bombers of the Royal Airforce’s Dam Buster squadron that finally put paid to Tirpitz using 12,000lb Tallboy earthquake bombs designed by Barnes Wallis. This entry was posted in Film Review and tagged Above Us the Waves (1955). Bookmark the permalink.